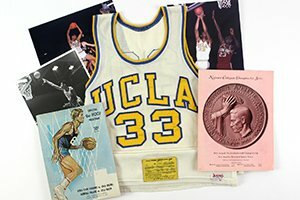 MEARS Auctions is excited to announce that we will be featuring a 1969 circa Lew Alcindor UCLA Game Worn Jersey & Memorabilia Collection in our May 26th, 2017 auction. The collection was obtained directly from the UCLA assistant team manager and has been in his possession since obtaining it from the team equipment manager in 1970. 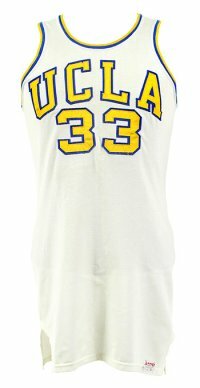 The new team had been outfitted with uniforms, but Alcindor’s #33 was not to be issued out of respect for his legacy at UCLA. Our consignor, now integrally involved with assisting Coach Wooden with the team’s day to day activities, was gifted the shirt and he has cherished it ever since. Our consignor chose Alcindor for his on court accomplishments, but more importantly to him, for the awareness he brought to important social issues highlighted during the 1960s, especially the treatment of African Americans which was highlighted by Alcindor’s refusal to participate in the 1968 Mexico City Olympics in protest against racism in America. MEARS Auction is aggressively seeking quality items to add to our May 26th, 2017 sale. Consignment deadline for this auction is May 20th. Currently in house is a run of complete sets of Baseball, Football, & Basketball from 1963 to present, 1986 Fleer Basketball Set with Jordan RC, 100+ game used bats including many high grade examples, and many more assorted lots. Consign Today! For a free appraisal and market evaluation, please contact Troy R. Kinunen at (414)-828-9990.